We’d love your help. Let us know what’s wrong with this preview of No Room for Hondo by Joey Lynn Resciniti. Who are you? That can be a difficult question for a brand new first-time mother. Isolated by the stay-at-home life, sleep deprived, and under stimulated, Marty Roscigno wasn't adjusting to her new life. Instead she was fostering a new reality of her own making. No Room for Hondo follows Marty through mental illness and family crisis. She endures mundane everyday battles an Who are you? That can be a difficult question for a brand new first-time mother. Isolated by the stay-at-home life, sleep deprived, and under stimulated, Marty Roscigno wasn't adjusting to her new life. Instead she was fostering a new reality of her own making. To ask other readers questions about No Room for Hondo, please sign up. No Room for Hondo is a good book for new mother's who are trying to find their purpose in life other than just motherhood! What I loved about this book was it became an eye-opening experience in the life of one mother. As the prospect of becoming a mother nears for myself, I've found myself thinking a lot about motherhood, pregnancy, and the life thereafter. 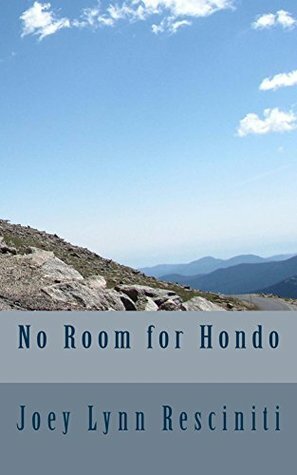 So by reading about Marty's experience, I felt like I could live her life with her and learn about what could happen if you don't have the No Room for Hondo is a good book for new mother's who are trying to find their purpose in life other than just motherhood! What I loved about this book was it became an eye-opening experience in the life of one mother. As the prospect of becoming a mother nears for myself, I've found myself thinking a lot about motherhood, pregnancy, and the life thereafter. So by reading about Marty's experience, I felt like I could live her life with her and learn about what could happen if you don't have the proper support around you, if you don't sleep, and if you can't find your purpose and maybe aren't able to articulate that to others. One thing I did struggle with was the timeline of the book. I didn't go into reading it with the knowledge it would follow Marty over the course of six years. While maybe intentional, bringing you on the journey of how Marty felt, I wish there was more a focus on a certain aspect. Because the timeline covers six years, it's hard to focus too much on any aspect of her life or the years that pass. I understand the necessity, showing that Marty really found herself after her daughter starts kindergarten, when she has days completely to herself again, but I found it difficult to connect with Marty when she wasn't dealing with mental illness. Throughout the beginning of the book, I thought that's what it would revolve around, as it takes up a good portion of the book. I am a wife, mother, and writer. I live North of Pittsburgh in a township populated by an extraordinary number of pizza shops. I married my high school sweetheart (it still counts even though we went to different high schools) in 2002. We have one daughter and two shih tzus called Luke & Leia. We like Star Wars. I blog at Big Teeth & Clouds where I was almost famous once for writing about Eg I am a wife, mother, and writer.